So most textbooks would have you believe that the intergalactic medium (usually known as the IGM) is largely just a barren void. A total vacuum in most places with a density of about 1 atom per cubic metre. Virtual nothingness. Actually, the IGM is seemingly interspersed with vast gas clouds. And when I say vast, I really mean vast. The image is a radio telescope mosaic image of Smith’s Cloud, a huge cloud of hydrogen gas in intergalactic space. It’s around 11,000 light years long (which is about 1/10 the width of the Milky Way, or as large as a small galaxy!). Actually, if you could see it with the naked eye, it would appear 20 times as big as the full moon in the night sky. Smith’s Cloud is travelling at high speed directly towards the Milky Way — at around 240km every second. It sounds ludicrously fast, but it’s not actually going to reach us for at least another 20 million years. The part of the Milky Way it hits will probably undergo a dramatic burst of star formation after this happens, probably as a huge ring of stars. Seemingly, this isn’t the first time such a collision has occurred, either. 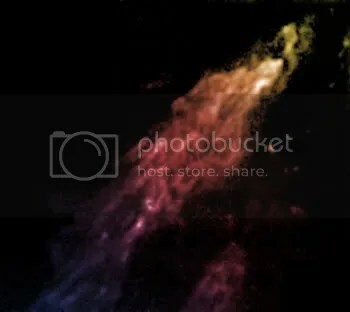 We know, because we’ve seen a gigantic mushroom cloud (about 1000 light years big) sticking out of our galaxy, where a similar cloud has ploughed straight through and emerged from the other side, as well as some huge gas loops sticking out of other parts of the galaxy. What’s more, there’s a ring of stars around 2000 light years in diameter (including some of the brightest nearby stars) in our galactic neighbourhood that could’ve formed as a result of a similar event. When the biggest ones go supernova, they then trigger smaller rings of stars encircling them, a lot like rings of mushrooms. Personally, I think that’s rather poetic. Circles really do exist everywhere. This entry was posted in astronomy, Imported from Livejournal and tagged astrochemistry, astronomical images. Bookmark the permalink.